A mayor has apologised after underestimating his administration's running costs by £6.75m. 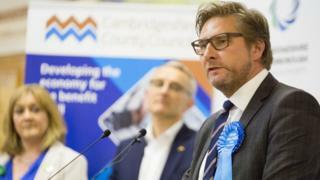 James Palmer, Conservative, pledged to keep costs to £850,000 a year when running for the new office of Mayor of Cambridgeshire & Peterborough in 2017. It has emerged the cost of the Cambridgeshire & Peterborough Combined Authority will be £7.6m this year. Labour's Lewis Herbert said costs were "spiralling out of control" and money should be spent on infrastructure. "Every £1 of unnecessary operating costs overspend is £1 lost from the new rail, road and housing projects, " said Mr Herbert, leader of Cambridge City Council and board member of the combined authority, which was established last year. At a meeting of the combined authority's overview and scrutiny committee, Mr Palmer said: "I can only apologise. "I think, realistically, we were never going to be able to function on £850,000 a year." Mr Palmer has commissioned a review of the combined authority. It is made up of the directly-elected mayor and representatives from the seven local councils and has powers over housing, infrastructure and business development. Mr Lewis and fellow board member Bridget Smith, Liberal Democrat leader of South Cambridgeshire District Council, will call for cost-cutting measures at this week's board meeting, according to the Local Democracy Reporting Service. Ms Smith said the public's perception of the new authority was one of "escalating running costs" with no real difference being made to residents. Mr Palmer said staff and costs from the former Local Enterprise Partnership, which was scrapped in December 2017, had been taken on by the authority.